Our Veggie Bowl is our real go to dinner. Delicious as it is, we also eat in on a Baked Potato, over Rice or mixed with Quinoa (especially lovely when we mix the white with the red). There are several benefits worth mentioning. In addition to the delicious flavor, you can truly eat as much of this as you want, reaching that "very full" feeling. Also, it tastes wonderful with our Vegan Gravy especially layered over the Baked Potato before we add the vegetables. Another way we like it is with a Tablespoon or two of Thick Minestrone ladled over it. The vegetables you use are totally up to you. Listed below is one way we make it, however we change the kind and quantity each time we as well as the seasonings so it always tastes different and always good. We cannot stress enough how important it is to thoroughly wash all produce, preferably using a Vegetable Wash. It is a good idea to slice and chop everything before you start cooking them since the cooking process moves quickly and you certainly don't want overcooked, mushy veggies. Spray a non-stick skillet with Pam and then lightly spray it with a good quality of Olive Oil. 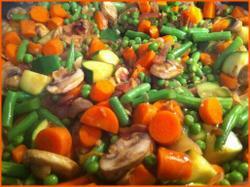 Turn you heat to high and when it is sizzling add the Onions and Carrots. Immediately turn the heat down to medium high and cook for two minutes stirring frequently (keep the food moving around so it doesn't burn.) Once the Carrots and Onions have started to soften, turn the heat down to medium. Add the Green Beans and continue cooking for approximately three to five minutes until they begin to soften. Then add the Garlic, Zucchini and Mushrooms and cook until just tender. Do not Overcook! Turn the heat to low and stir until the Peas are completely thawed. 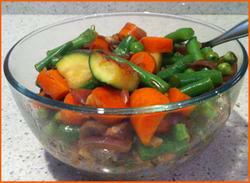 It is important that you use the vegetables that you and your family like for your Veggie Bowl. If they are different than the ones listed above, just cook them in the order of density - for example, frozen corn would be placed in the same order as the Peas. Cauliflower or Broccoli around the same time as the Green Beans. Add more or less to taste. The possibilities are endless with the result being Healthy, Delicious, Filling food with very few calories.